"The most blessed thing about being an author is that you do it in private and in your own time. It can worry you, bother you, give you a headache; you can go nearly mad trying to arrange your plot…but — you do not have to stand up and make a fool of yourself in public." Her first book waited five years before publication, having been rejected by six publishers. She wrote her first book as the result of a challenge from her sister, Madge. Miss Marple was modeled on her maternal grandmother. She was a dog lover and owned many dogs throughout her lifetime. She hated marmalade pudding and cockroaches but loved the color green and flowers – her favorite was Lily of the Valley. What a cool quick snapshot of this famous author. I love her quote about writing! She is one of the authors I admire and I dreamed, as a child, to become, one day, an author like her. Thank you for your comment, Mae! Yes, we can relate to it, can't we? Thanks for checking the post, Mary! 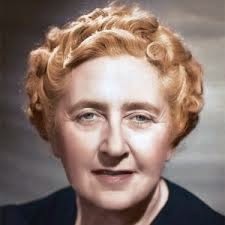 I love reading Agatha Christie, I adore Miss Marple. This quote sums up so much of the authoring process. Thanks for this. I love Miss Marple more than Poirot. Thanks for stopping by, Daisy!